London is a Canadian city located in Southwestern Ontario along the Quebec City–Windsor Corridor. 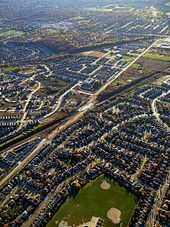 The city has a population of 366,151 according to the 2011 Canadian census. London is at the forks of the non-navigable Thames River, approximately halfway between Toronto, Ontario and Detroit, Michigan. The City of London is a separated municipality, politically separate fromMiddlesex County, though it remains the county seat. London and the Thames were named in 1793 by Lord Simcoe, who proposed the site for the capital of Upper Canada. The first European settlement was between 1801 and 1804 by Peter Hagerman. The village was founded in 1826 and incorporated in 1855. Since then, London has grown to be the largest Southwestern Ontario municipality, and Canada's 11th largest municipality, having annexed many of the smaller communities that surrounded it. The area was formed during the retreat of the glaciers during the last ice age, which produced areas of marshland, notably the Sifton Bog (which is actually a fen), as well as some of the most agriculturally productive areas of farmland in Ontario. The Thames River dominates London's geography. The North and South branches of the Thames River meet at the centre of the city, a location known as "The Forks" or "The Fork of the Thames." The North Thames runs through the man-made Fanshawe Lake, located in northeast London. Fanshawe Lake was created by Fanshawe Dam, constructed to protect the downriver areas from the catastrophic flooding which affected the city in 1883 and 1937. London has a number of parks. Victoria Park in downtown London is a major centre of community events, attracting an estimated 1 million visitors per year. Other major parks include Harris Park, Gibbons Park, Fanshawe Conservation Area (Fanshawe Pioneer Village), Springbank Park, and Westminster Ponds. The city also maintains a number of gardens and conservatories.